Sketch design is the first step towards Development Approval. This is not a legal requirement such as the subsequent steps of Planning Approval or Building Rules Approval. A Sketch design is simply about sorting out what you want. Initially I will take your brief. This means we have a conversation and I look at any material you may want to show me. 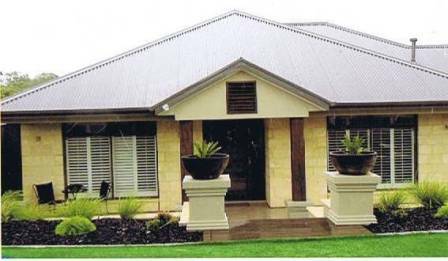 This usually is pictures of similar buildings that you like and plans you may have collected from looking at house inspections or show homes. Preparing a scrap book beforehand will help firm up your ideas and give us a place to start. I preferably do this on location so I can get a feel for the site and take preliminary measurements. I can however do all of this remotely if your site is in the country or you feel the cost of a site visit is not justified. 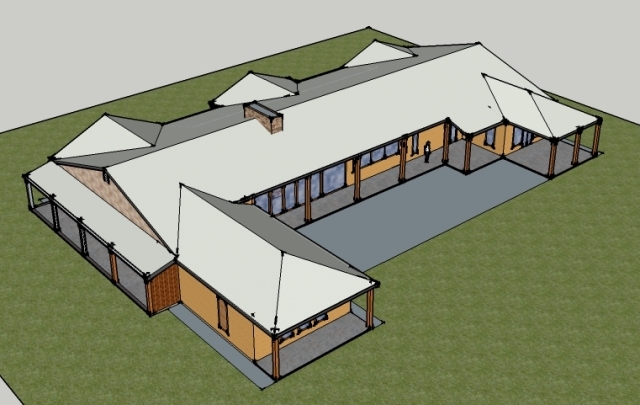 Depending on what you require a Sketch design can be quite a short process or it can be quite complicated. 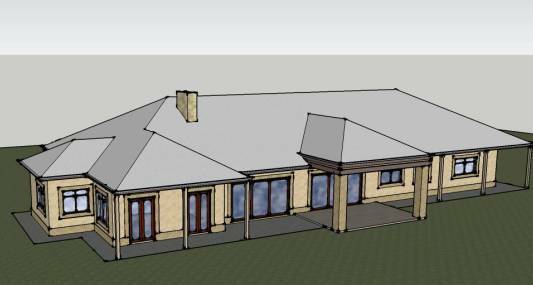 The following plans are a Sketch Design for a Country House in the District Council of Mount Barker, Adelaide, South Australia. 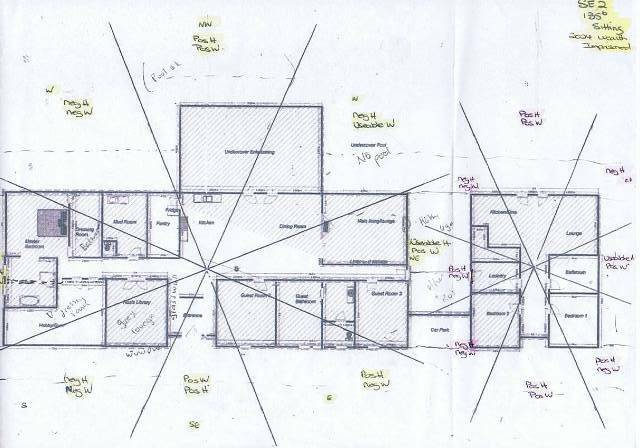 The clients gave me plans they had both seperately drawn up and showed me images of houses they both liked. 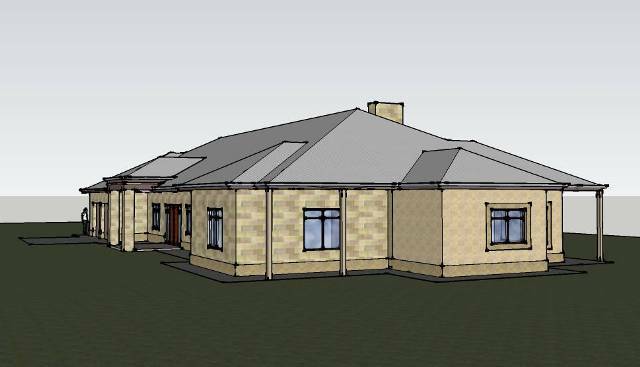 The challange was to produce a set of house plans they both liked and find a site for the house on their property that not only they and the Council approved of but one that adhered to Feng Shui as well as Passive Solar Energy design principals. The 4 Architectural perspectives below came from an early set of plans that appealed to both partners. 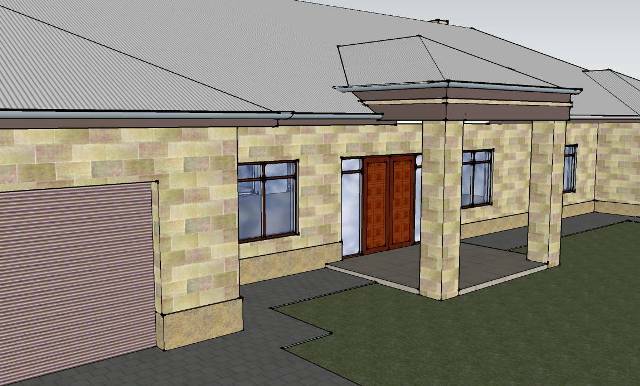 The plans forming the basis of this design included everything the clients wanted with no regard to budget. This was a dream home. 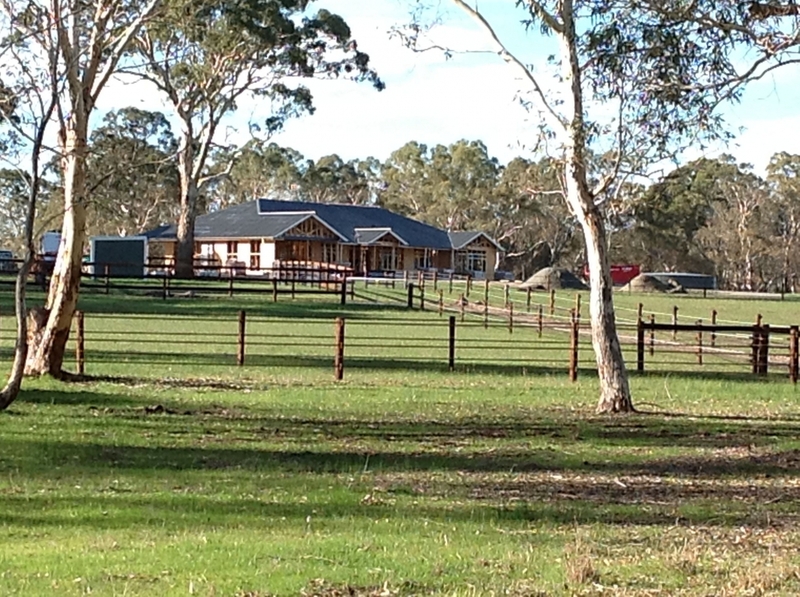 The house size needed to be reduced to meet budget & resulted in the clients carefully re-thinking what they wanted. Because this house is to be used as a Rural retreat a design evolved that presented the building more as a 3d object than the usual one dimensional facade of most City dwellings. 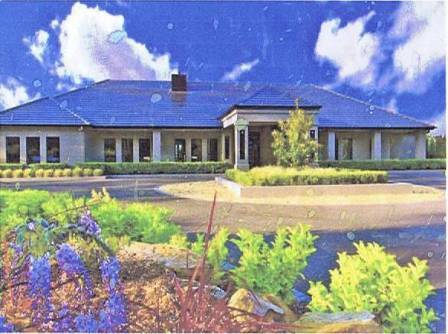 The building addresses all the cardinal directions and so provides views over the entire property. 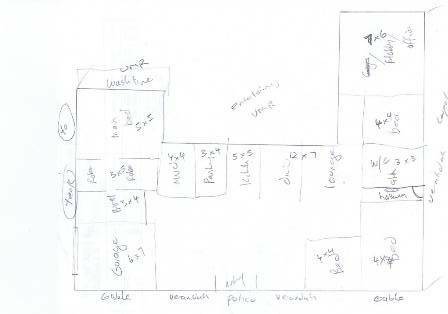 The client used this set of perspectives and the dimensioned floor-plan to get a preliminary quote from a builder. 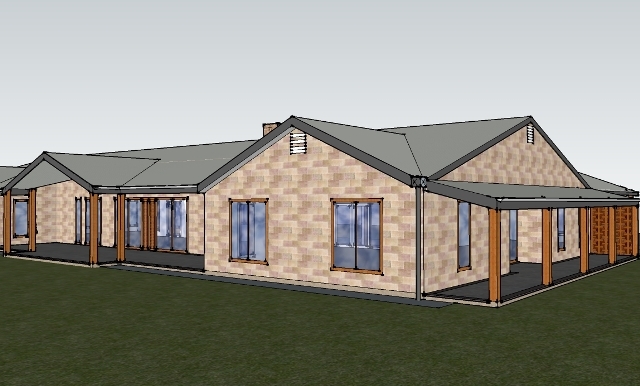 The house came in within their price range and they are ready to progress to Planning Approval stage. 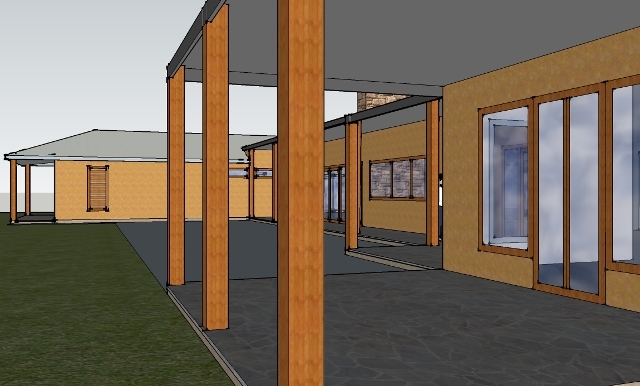 The client chose a non-traditional path from this point on and signed up with their preferred builder using the Architectural sketch documentation as a basis for their contract. In theory this sounds like a good idea, as all the money the clients spent on documentation was purely on design and they were able to utilise my skills to provide them with multiple iterations until they came up with something that suited both their taste and budget. 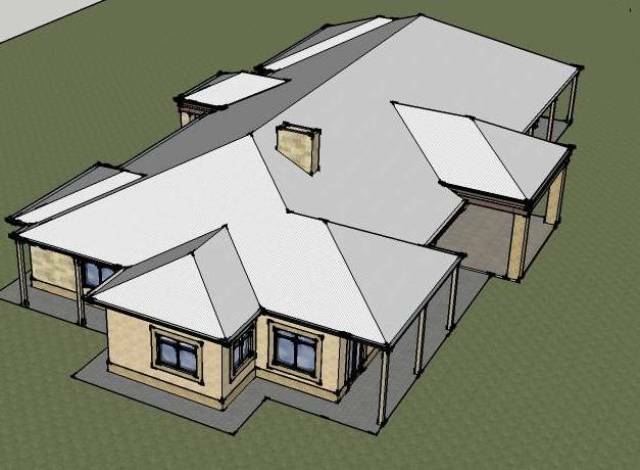 This saved the clients around 4 to 5k in Architectural documentation and Council Approval fees, as once signed up the builder took care of the rest of the process for them. Unfortunately nothing is free and this money was hidden in the cost of the subsequent build. As expected there was a cost blow-out from the builders original quote. It is worth spending a little extra on documenting a job properly just to ensure that everything is explicitly covered. Signing a contract with a builder without a full set of documentation can be a problem as the contract is based on what is in the documents. If the builder supplies the documents the chances are that it will not be in the Clients best interest and it will skew the balance of power in the Builders favor. If it is some-one you know and trust this is not a problem, but experience has shown it usually leads to substantial cost increases during the build. Much is implied rather than explicit in a standard set of builders plans & as the Contract refers to the plans for scope of work it is easier for the Builder to claim cost variations. A good set of Architectural working drawings would have ensured that nothing was left to chance. The golden rule of building is that a little extra money at the beginning of a job spent on perfecting the design and documenting it properly will save large amounts of money during the build.